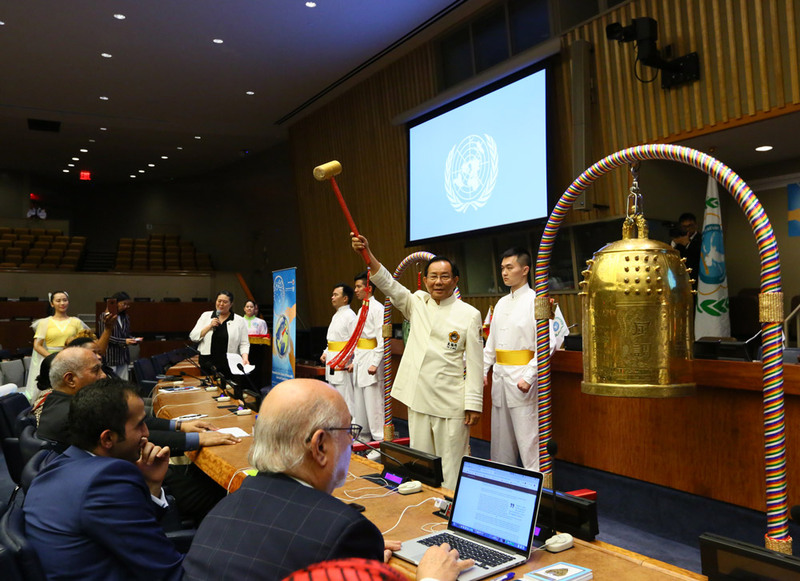 NEW YORK—The Bell of World Peace and Love resonated at the United Nations Headquarters on October 1, 2018, at the World Leader Summit of Love and Peace during the 73rd session of the United Nations General Assembly. 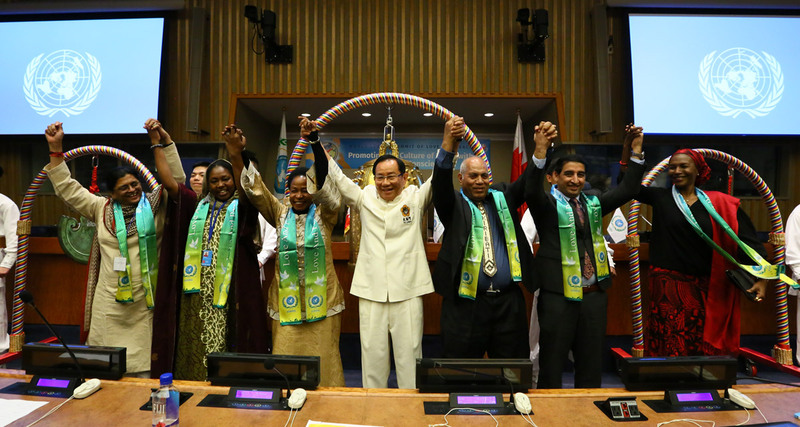 Afterwards, seven more visionary leaders rang the Bell and made their wishes for peace: H.E. 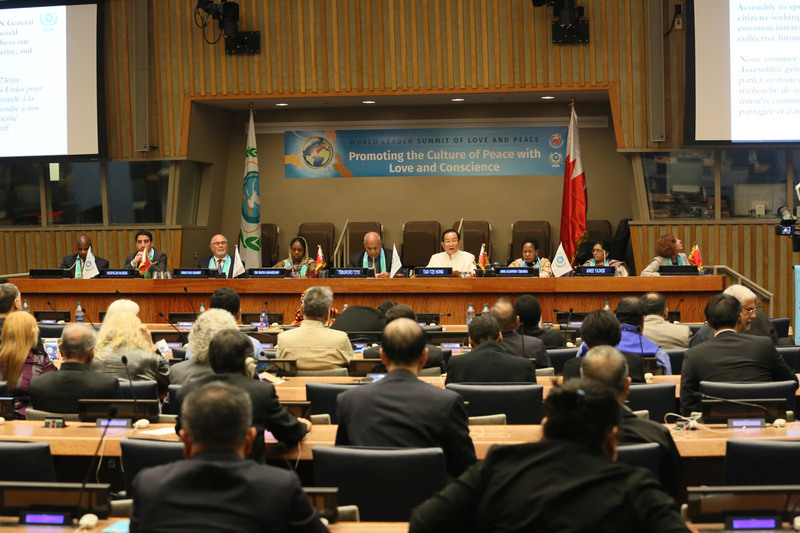 Mr. Teburoro Tito, Ambassador of Kiribati to the UN; Mr. Hatem Abdulhameed Hatem, Second Secretary for the Permanent Mission of Bahrain to the UN; H.E. Fatima Kyari Mohammed, Permanent Observer of the African Union to the UN; H.E. Mr. Nazifullah Salarzai, Deputy Permanent Representative of Afghanistan to the UN; Dr. Amee Yajnik, leader of Indian National Congress in the state of Gujarat; Professor Anna Tibaijuka, former Under-Secretary-General of the UN; and Dr. Nagwa Gadaheldam, Senior Advisor to President Museveni of Uganda. Dr. Hong, Tao-Tze, President of FOWPAL, presented each of the bell ringers with a “Key to the Heart,” which symbolizes that the key to a sustainable future lies in the heart, especially the heart of every influential leader. 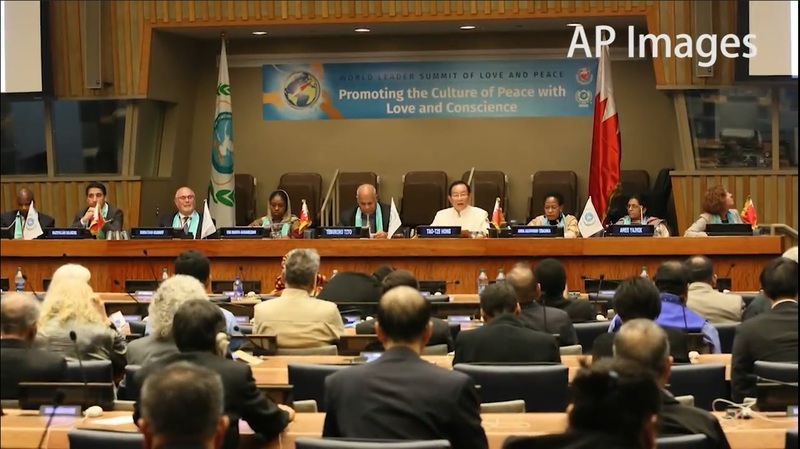 This year, FOWPAL has worked with various UN missions and participated in many conferences and seminars at the UN with a focus on promoting a culture of peace with love and conscience. This time it organized the summit in cooperation with the Kingdom of Bahrain to consolidate visionary leaders’ kind intentions and to inspire global citizens to take actions to improve the well-being of all. In appreciation of the support and assistance of the Bahraini Mission, Dr. Hong, Tao-Tze, President of FOWPAL, presented a certificate of honor to the Permanent Mission of Bahrain to the UN; Mr. Hatem Abdulhameed Hatem, Second Secretary for the Mission, accepted the certificate on behalf of the Mission. The Bell has traveled across the planet, reaching out to every culture and every community to spread joy and good fortune and to nurture the Earth. 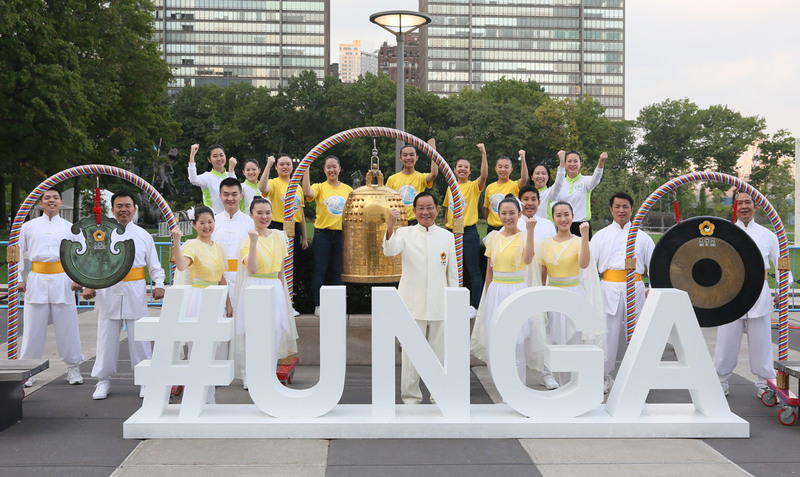 Since 2000, the Bell has been rung by 318 influential leaders in 101 nations, including 38 heads of state and government, 7 Nobel Peace Prize laureates, UN ambassadors, and other visionary leaders. 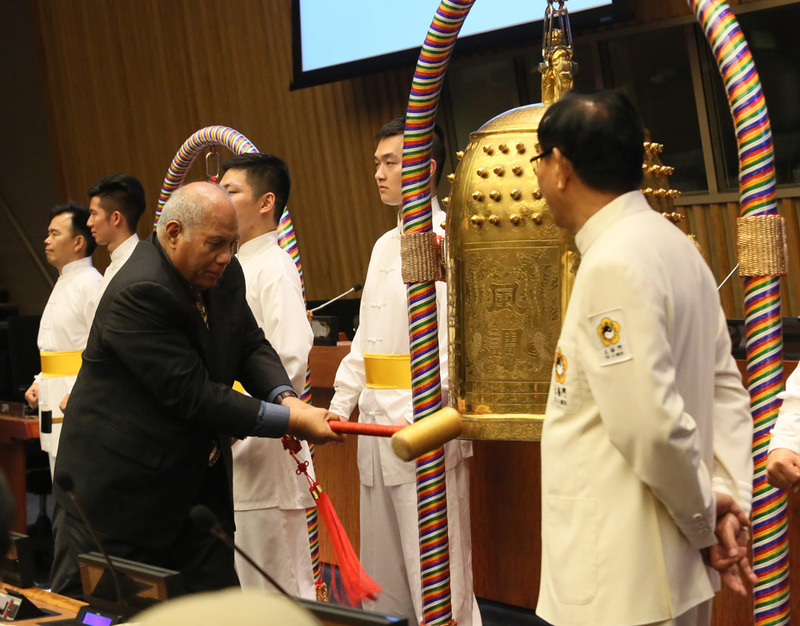 The Bell was also rung during the World Summit on Sustainable Development (WSSD) held by the United Nations in Johannesburg, South Africa in 2002 and during the United Nations Conference on Sustainable Development in Rio de Janeiro, Brazil in 2012. Through the bell-ringing ceremonies, the bell ringers’ kind wishes for a better world were consolidated to inspire more people to promote the culture of peace with love and conscience in their nations and across the Earth. 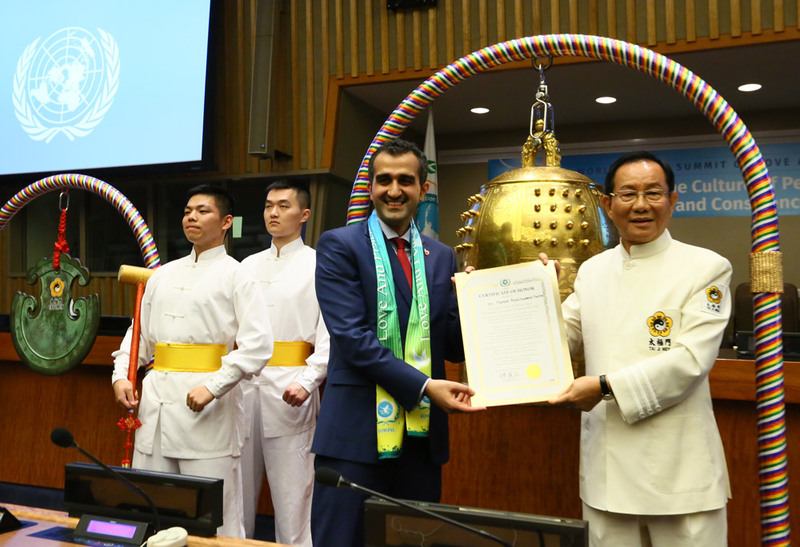 In addition to the bell-ringing ceremony, the summit also featured insightful speeches by visionary leaders, including Dr. Hong, Tao-Tze, President of FOWPAL; H.E. Mr. Teburoro Tito, Ambassador of Kiribati to the UN; H.E. Mr. Nazifullah Salarzai, Deputy Permanent Representative of Afghanistan to the UN; Dr. Amee Yajnik, leader of Indian National Congress in the state of Gujarat; Professor Anna Tibaijuka, former Under-Secretary-General of the UN; Dr. Nagwa Gadaheldam, Senior Advisor to President Museveni of Uganda; Dr. Jonathan Granoff, President of the Global Security Institute; Ms. Bircan Unver, Founder-President, TV Producer and Head NGO Representative to the UN DPI The Light Millennium; and Rev. Cornell Edmonds, the Interim Pastor of the Church of the Covenant. "Only with conscience will love and peace be practiced so that human rights be enhanced. Only with conscience will human rights be respected so that love and peace prevail,” stated Dr. Hong, Tao-Tze, President of FOWPAL. FOWPAL has been keen to unite peace-loving individuals and organizations to work together for the greater good. 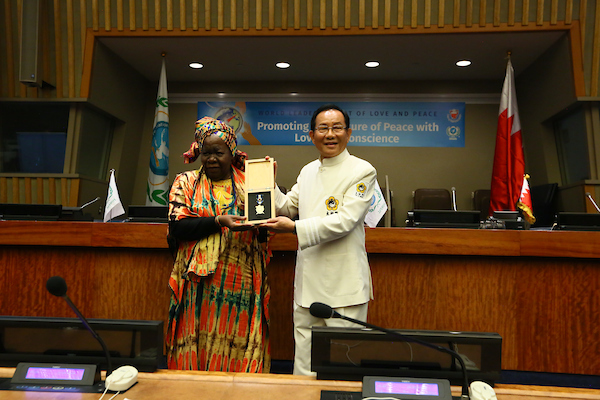 At the summit, Dr. Hong, Tao-Tze, especially presented a Lifetime Achievement Award to Harlem's Queen Mother Dr. Delois Blakely because she has been dedicated to humanitarian work at the United Nations for nearly 50 years. October 1 happens to be her birthday, so the attendees sang a Happy Birthday song to her, conveying their best wishes to her. At the end of the summit, FOWPAL youth volunteers galvanized the entire room with an energetic dance titled “Celestial Horse Dance,” spreading tons of positive energy to encourage the participants to keep on promoting love and peace throughout the world!